You are here: Home / Blog / Finish Your Quilt UFOs! Quelle belle idée en ce début d’année de parler de ces UFO ! Je me suis reconnue là dedans, ma toute première courtepointe commencée il y a environ 10 ans n’est toujours pas terminée et depuis j’en ai commencé 3 dont une seule est terminée. Et cela ne m’empêche pas de continuer à acheter du tissu bien sûr. Au moins l’un de ces projets est un WIP. Je vais aller explorer plus à fond l’hyperlien vers l’autre site. Votre message me rappelle qu’il faut faire une planification pour que les choses avancent. Merci et bonne journée du Québec dans le froid hivernal. P.s. Je vous ai déjà écrit en français dans le passé vous vous souvenez, cela vous fait pratiquer ce que vous avez appris en France. Oui, je vous rappelle, et je suis tellement contente de lire cette belle langue. Mais, alors, mon cerveau me fait mal …. il y a si longtemps. Excusez-me pour mon écriture! Bonne année et bonne chance avec vos UFOs (et le WIP)! 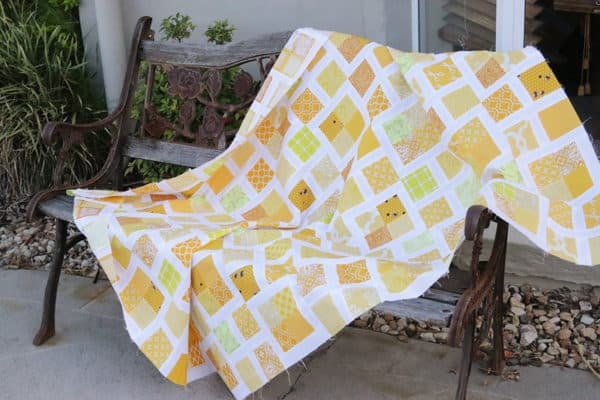 I love that yellow quilt top, it’s so cheerful. I have been working on UFOs also. I have been trying to do one after each new finished quilt. I’m not always in the mood, they are getting finished a little at a time. That’s a great idea, Bobbie, alternating WIPs and UFOs. That way you keep up the interest and the momentum on both sides. Good luck with getting through yours this year. Great post Kirsty. Funny how we try to remember a plan or explanation for our methodology and come up blank! This is a lovely quilt top though. So sunny and cheerful. 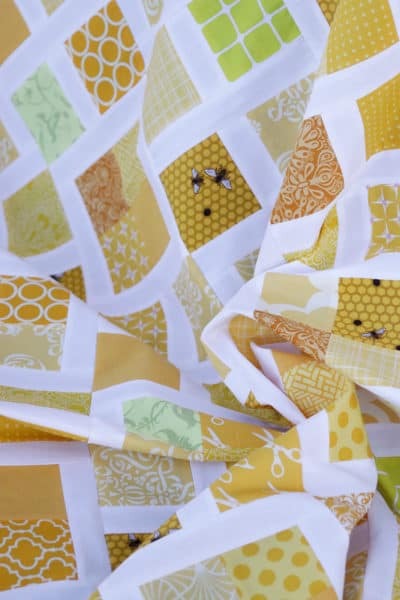 I am quite a fan of monochromatic quilts- using all shades of yellow is so sweet! Hi Bernie, it certainly is hard to stay sad looking at a bright yellow quilt! Kirsty, how did you repair those seams? I have a WIP (it hasn’t reached UFO status, and won’t, but I had to set it aside while I moved houses) that has the exact same problem. I have been wondering about the best way to fix those pulled-apart, pressed-open seam ends. I would love to know what you did and what you learned. Hi Rachel, I wish I had a clever answer but it was really just hard work resewing the seams. I finger pressed the seam allowances back together (as mine were pressed open) and then sewed the seam again. I didn’t do the whole seam, just to about a half inch past where it started to come apart. I didn’t feel a need to repress the seams open after, I just made sure I pinned my rows before sewing (both to match seams and also to keep the seam allowances open if needed). Thank you — I thought that was probably it 🙂 I’ll be doing the same thing soon! Such a beautiful quilt! I have the problem with my seams coming undone on fresh projects if I, say, sew strips x wof and then slice that into smaller pieces. What am I doing wrong? Shorten the stitch length for seams you are going to cross cut. Also, the sooner you can sew those units into a completed quilt top, the better. The seams will be protected by the intersections with other seams. 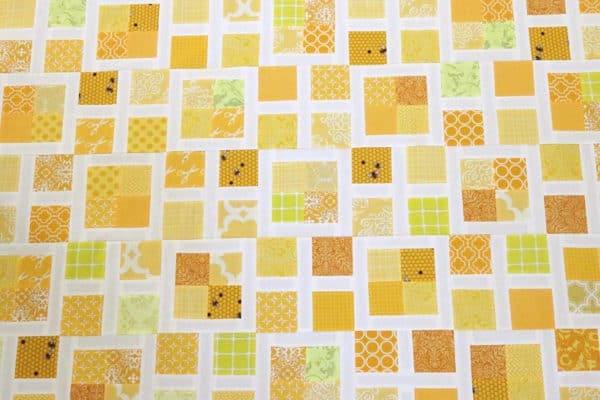 At the end, to make sure your final outer seams on your quilt top don’t pull apart, lots of folks like to sew a quick seam 1/8″ around the edge of the whole top. This makes sure none of the seams pull apart, and you don’t have to worry about removing it later as it should be hidden under your binding (as it’s sewn so close to the edge). Hope that helps! Oh my goodness, BEST GIFT EVAH! You have a wonderful friend there, Rae! Those darn split seams. That’s why I now do a short backstitch at the beginning and end of all seams. Then when the quilt top is finished and trimmed to size, I stitch close to the edge all around the quilt top. If I should see a split seam at that time after trimming, I fix it right away. The backstitched bits always end up in a seam allowance, and I’ve never found that they interfered with accurate piecing. I like your cheery yellow quilt! Loved the post and found it inspirational. Just in time as the blush of the New Year enthusiasm was waining. The comments are also encouraging. After a few years of not being able to sew but still managed to start several projects during good days I’m back at the helm. Very much looking forward to a successful year and your post gave me a boost. Alternating UFO’s and WIP is a great idea. Changing projects keeps the sparks flying. I agree Patty, I think alternating is a great way to get through a UFO list that might seem daunting at first glance. Just chipping away at it over the year could be the winning formula. Best of luck getting back into the swing of quilting, I hope you achieve all your goals for 2019! Great to hear, Allison, best of luck getting through your UFOs this year!